Posted on 1 October, 2014 at 8:29 pm. Use non-comedogenic or non-acnegenic products. Non-comedogenic cosmetics and suntan lotions won’t clog pores. Non-acnegenic products won’t cause pimples. Cosmetic products that contain lanolins, isopropyl myristate, sodium lauryl sulphate, laureth-4 and D & C red dyes should be avoided. Like oil, these ingredients are too rich for the skin. One of our great aestheticians at Great Skin can recommend the best products. If you do use a moisturizer, make sure it is non-acnegenic. If irritation, dryness and peeling occur, use an oil-free, non-acnegenic, or non-comedogenic moisturizer. Check with an aesthetician at Great Skin for recommendations on a great moisturizer. Great Skin has a variety of products for acne, but we always show our clients how to apply them properly. The pore-clogging process happens two to three weeks before any blackheads or blemishes become visible on the skin. Apply acne products about half an inch around the affected area, to help keep the acne from spreading. Acne moves across the face from the nose to the ear, so you need to treat beyond the inflamed area. Most people make the mistake of treating only the pimples and not the outlying areas of skin. 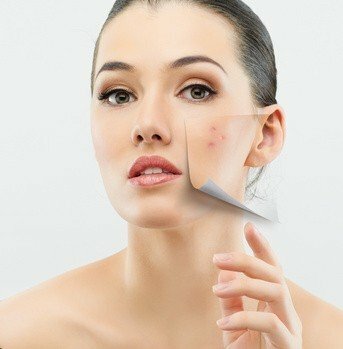 Come by Great Skin and one of our aestheticians would be happy to show you how to apply acne products correctly. In adult women, make-up is the major factor in acne outbreaks, especially oil based products. It’s the oil that causes the problem. The oil is usually a derivative of fatty acids that are more potent than your own fatty acids. Use a non-oil-based make-up if you are prone to acne. Avoid thick, greasy make-up over affected areas. Some make-up is acceptable but try to choose “non-comedogenic” cosmetics if possible. Avoid covering yourself with thick layers of make-up, and if you do, wash it off as soon as you can, certainly do not leave on overnight. Wash the skin gently with a mild facial cleanser and warm (not hot) water twice daily. Hot water and harsh cleansers can further irritate your skin and undermine your acne prevention efforts. Pat dry. Great Skin offers a variety of great facial cleansers for acne-prone skin. Many people don’t know how to wash their face properly, which is a very important step in acne prevention. Drop by the spa and we will show you how to wash your face properly. Wash your make-up off thoroughly as soon as possible. Do not leave it on overnight. Use a mild cleanser and make sure you rinse well. A pimple is an inflammation, and you could add to the inflammation by squeezing it, which could lead to an infection. A pimple will always go away in one to four weeks if you leave them alone. Let it stand and ferment. Drink and enjoy! Some acne products may cause adverse reactions to the sun, so minimize you exposure. Acne isn’t really helped by the sun. Although a suntan can temporarily make acne look less severe, it won’t help it go away permanently. Don’t soak up those rays – either under the sun or from a tanning bed – in an effort to help your skin. Wearing headbands and that touch your forehead can make acne worse. Don’t touch your face because your hands have oil on them and this can make acne worse. Exercising regularly can also help reduce stress and it increases blood circulation and oxygen penetration to the skin, which may help with acne prevention. If you work out, bring along pre-moistened alcohol towelettes to wipe sweat off your face, back and chest. Use towels to cover neck and chest areas to prevent coming in direct contact with the equipment. Sweat combines with skin oils to trap dirt and bacteria in your pores, causing blackheads and pimples, so it’s important to shower as soon as possible after you work out or sweat profusely. Since stress can trigger acne, try to avoid stressful situations, resolve stresses by talking to friends/family or a professional. Great Skin Spa and Skincare in Arlington, TX offers a variety services to treat acne. We also have a wide array of acne products, including our Clarifying Camphor Mint Masque. We also offer a facial club to help make acne treatments more affordable.